No one can stop Bell. Pittsburgh Steelers running back Le’Veon Bell had himself a day on Sunday. He rushed for 236 yards against the Buffalo Bills, breaking the Pittsburgh single-game rushing record that was set by Willie Parker in 2006. Bell also caught four passes for 62 yards, giving him a total of 298 yards from scrimmage. That’s tied for the 10th-most in a regular-season game since at least 19501 — and it’s more than the entire Bills offense gained against the Steelers defense. On a day when quarterback Ben Roethlisberger struggled (37.8 passer rating), Bell carried the team to victory. In an NFL season light on superlatives — no quarterback or wide receiver is having a historically great season — the top performers have been running backs. Dallas rookie Ezekiel Elliott leads the NFL in rushing yards, with 1,392, and is a big reason why the Cowboys are beating every team they play that’s not the Giants. 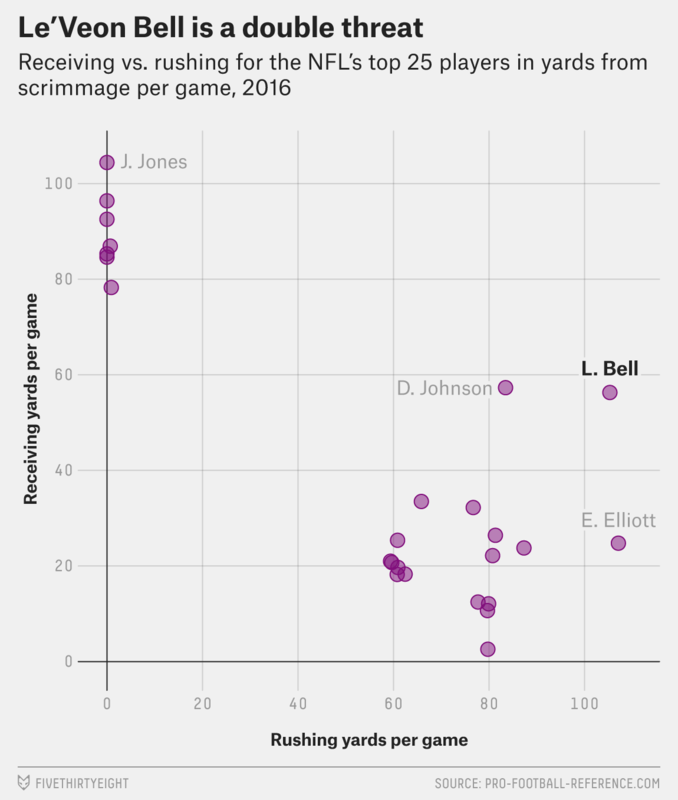 Arizona Cardinals running back David Johnson, my vote for midseason Offensive Player of the Year, has arguably been better than Elliott. Johnson has gained at least 100 yards from scrimmage in every game the Cardinals have played this season; he’s only the second player in NFL history to cross the 100-yard mark in each of his team’s first 13 games of a season. With no clear favorite for MVP this season, Bell is making a strong late-season push. And you can see it beyond the traditional stats. Among running backs, Bell ranks as the third-best rusher and the fourth-best receiver (subscription required), according to Pro Football Focus; he’s the only player in the top five in both of those metrics. He also is one of just four starting running backs averaging over 2 yards per carry after contact, bringing a power element to his game as well. This may be Bell’s best season, but he has been a yards from scrimmage monster for much of his career. In 45 career games, Bell has 3,830 rushing yards (85.1 per game) and 1,952 receiving yards (43.4 per game). That translates to 128.5 yards from scrimmage per game for his career, which would be the highest career average since 1932. Among the top 100 players in yards from scrimmage through four seasons, 1932 to 2016. Jamal Lewis was injured for the whole 2001 season, so his first four seasons include 2000 and 2002-04. Right now, Bell is second in the league in rushing yards per game and sixth in yards per rush. And among all players, he is fourth in receptions per game, with 6.7. If Bell can continue his dominance during the final three games of the regular season, he has a good chance of taking home the MVP — and dragging the Steelers into the playoffs while he’s at it. That’s the first year for which Pro-Football-Reference.com has game-level statistics for each player. That’s when the NFL began tracking individual yards. Although total yards and passing stats are at historic highs, rushing yards are near historic lows. Most statistics are best viewed in light of era adjustments, but that’s much trickier to do when it comes to yards from scrimmage; currently, teams are averaging just 107.6 rushing yards per game, the third-lowest average since the league starting tracking this metric back in 1932. As a result, it’s not clear what advantage, if any, modern running backs have when it comes to racking up big yards from scrimmage totals. For example, it was a wide receiver, Julio Jones, who led the NFL in yards from scrimmage last year, but it was with the lowest total by any player since 1996.